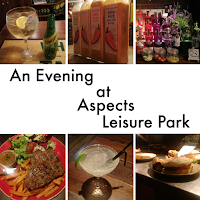 Last week I was invited on a press trip to Aspects Leisure Park in Bristol, to experience some of the delicious food and drink on offer and let you know what else there is to do there. Like most out of town leisure complexes, there are a lot of eateries and venues in close proximity, making it an ideal place to spend an evening out. It turns out, I've led a fairly sheltered life, as I discovered lots I hadn't experienced before, including gin. 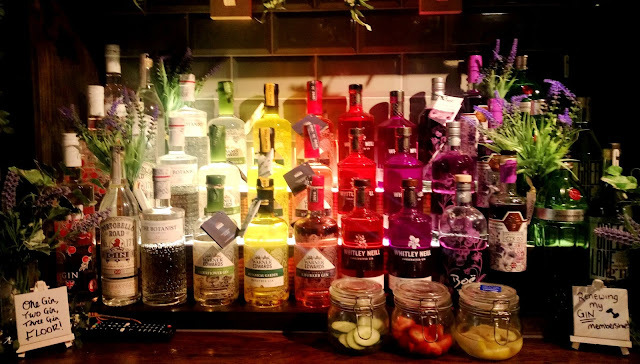 I had no idea I liked gin, it really was a revelation! 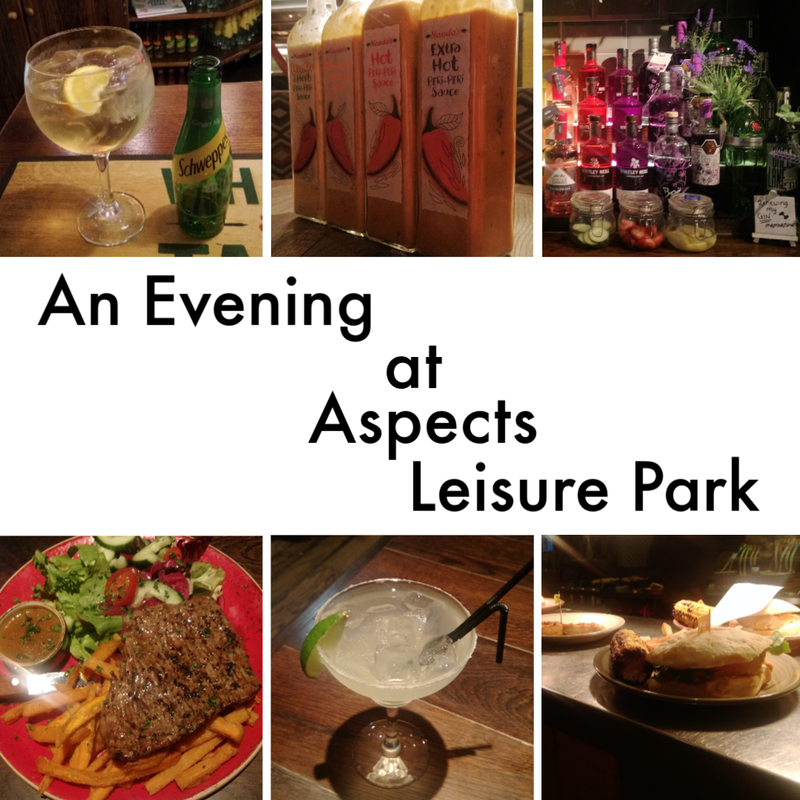 To find out what else I discovered, read our review of Aspects Leisure Park, Bristol. I was treated to free food and drink for the purposes of this review. Let us begin with the gin. I keep hearing about how great gin is, but I was brought up to believe that gin was the drink of the devil; 'mother's ruin', no less, so I had never got around to trying it. I had the perfect opportunity when I stepped into The Wishing Well, which is a Greene King pub, selling family-friendly meals, as well as providing play areas for children and imaginative drink options for adults. The staff are really knowledgeable if you want to try something new, and who wouldn't be tempted by a display like this? After a fairly substantial serving (picture a small goldfish bowl!) 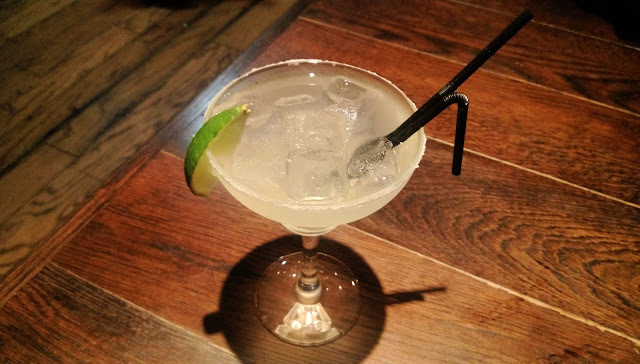 of Whitley Neal Rhubarb and Ginger gin, with Ginger Ale, it was time to move on to our next stop; Nando's. Where I have to admit to revelation #2... I've never been to Nandos! Not once, never. I don't know why, it's probably because I am the only one in my family who likes spicy food, so I don't have many people to go with. It was great to have the opportunity to try it out though, as I'm always hearing from friends that it's a great place to eat. We tried a platter of different flavoured chicken wings. 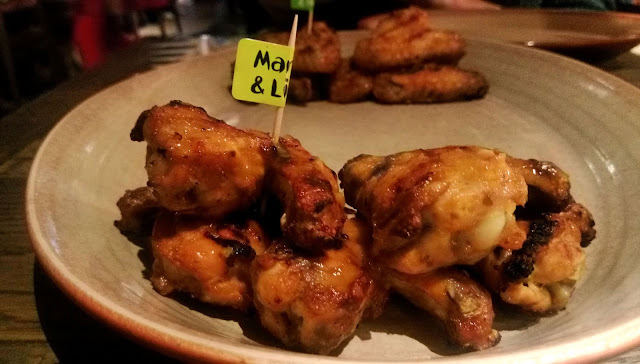 All the food at Nando's is labelled with a spice rating, which is really helpful if you haven't eaten there before. My favourite chicken was the Mango and Lime flavour, which was mildly spicy, but had a really delicious, slightly citrus flavour. While we were eating, I asked the waitress about her really colourful tee shirt. It turns out that Nando's are supporting a campaign in Mozambique to protect families against the devastating effects of Malaria. Mozambique is where Nando's source their PERi-PERi chilli from and the scheme allows specialists to go into people's homes and spray the walls with an insecticide that protects the inhabitants from malaria-carrying mosquitoes. I'm sure you'll agree this is a great cause to get behind, especially as malaria is preventable. There is a delicious way you can support this campaign, as Nando's are donating 25p from every Churrasco burger sold. You can also donate, or buy a bracelet from the Buzz Off Malaria page on their website. Our final stop, on our food and drink tour of Aspects Leisure Park was Chiquito, the Mexican Family Restaurant. This was a place I had always avoided, because I'm not especially keen on Mexican food. However, I am pleased to report that they have a selection of non-Mexican food, including possibly the most delicious steak I've ever had. It was ridiculously tender and my only complaint is it ended far too soon! 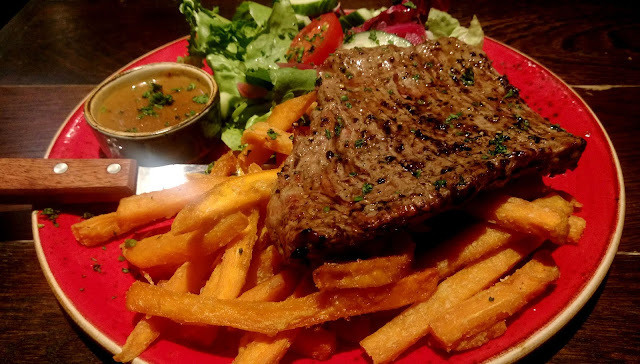 The steak I had was paired with my favourite sweet potato fries and something called a citrus salad. I didn't notice it tasting particularly citrus-y, but it did include a really amazing version of a simple sliced red onion. It looked so different, I had to ask what it was and the waiter told me that they had a special way of pickling the onion to make it taste milder and really tender. I wish I could make it at home. The waiter (I think he was the manager) was also very knowledgeable on drink options and introduced me to Tequila. He seemed to know an awful lot about Tequila, including how best to drink it, and what to serve it with. I also enjoyed my first Margarita and if there's one thing I've learned from this experience it's that I maybe need to get out more. Thank goodness there were so many helpful and friendly staff who could steer me in the right direction, when I was faced with so many different drink options. Chiquito even has an impressive list of cocktails, and mocktails for the drivers. We had a lovely time checking out Aspects Leisure Park and it was only a shame we couldn't stay longer. The complex also sports a Vue cinema, a bowling complex, and even a gym, so there's something for everyone and I will definitely be checking those out next time. 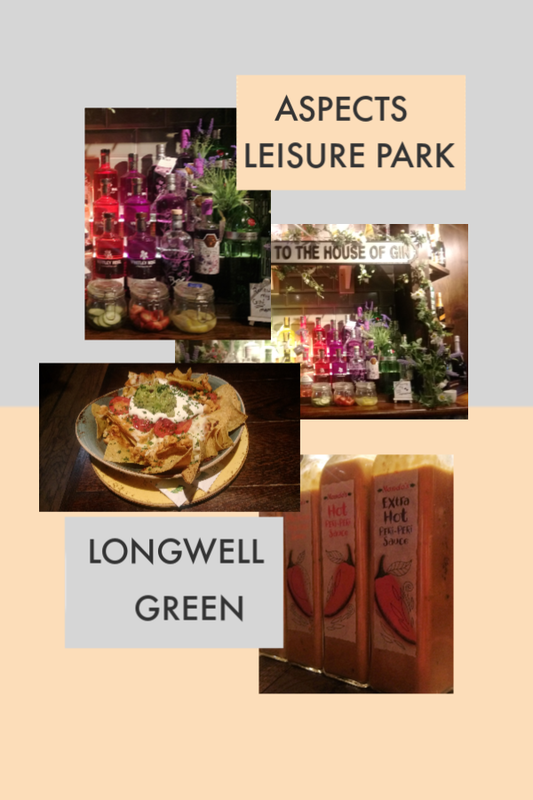 If you are in Bristol, or planning a visit, you can find Aspects Leisure Park on the A4174, sign posted Longwell Green. This looks like it was a lovely night out. 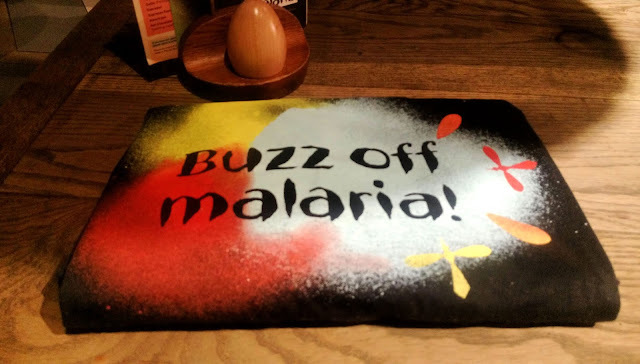 I love the fact that a restaurant is supporting an anti-malaria campaign in the country where they source ingredients.